Earlier this year I purchased a Glock 42 .380 ACP. As a member of the Armed Forces, I qualified for Glock’s Blue Label program (which, in my opinion, is the best deal in firearms marketing). My final price was $349 (plus tax) not including some 90 grain Hydra-Shoks I bought to carry. I walked out the door a very happy man. 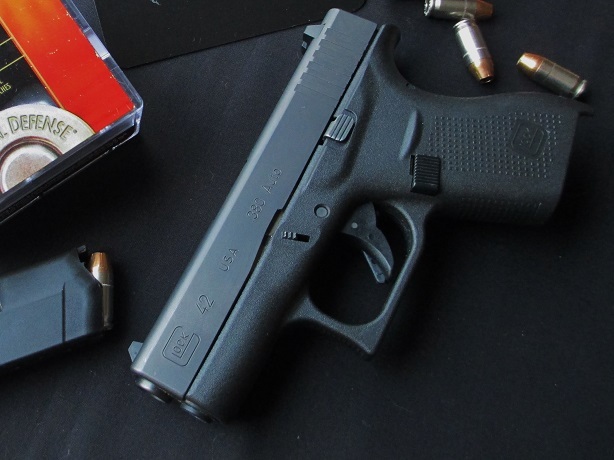 Before taking the G42 to the range, my initial impressions felt something like love at first sight. This is my first Gen4 Glock (although not technically listed as Gen4, it seems to borrow heavily from that series of guns aside from its lack of interchangeable backstraps). I like the plunger/captive recoil spring and rod, the oversized magazine release is pretty sweet (even for my bear-like paws), and I don’t hate the faux-stippling on the grip like I thought I would. The gun came with two 6-round magazines. The first thing I realized that I didn’t like about this gun was the rough machining on the front of the magazine. Another thing that I noticed right away was the magazine followers don’t look like all the other Glock magazine followers: these are flat with no groove on the side and look a little like a miniature 1911 magazine follower. 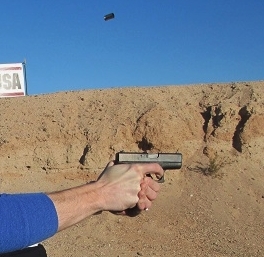 This range pic was taken at SHOT 2014, but notice how flat the gun is immediately after ejecting the spent casing. It handles the “snap” of the .380 very well. After having the G42 for a few months, I finally found time to get to the range. I shot my G42 in my local club’s annual IDPA Back-Up Gun (BUG) match. I know, I broke the rules of carrying and shooting a gun in a match that I had never fired. The timing just didn’t work out for me. I shot 55 rounds of Fiocchi 95 grain FMJ at the match and the gun functioned flawlessly, cycled every round, and locked back on empty every time. The only issue I had was an ammunition issue when one bullet fragmented into 6 pieces, essentially looking like I had shot the target with .380 buckshot (I know that such an animal does not exist, but that’s that it looked like). The gun is spec’d with a standard 5.5 pound trigger but this sample breaks right around 6.5 pounds according to a digital Lyman gauge. That’s heavier than both my G35 (3.5 pounds) and G23 (roughly 3.5 pounds), but suitable for a carry gun. 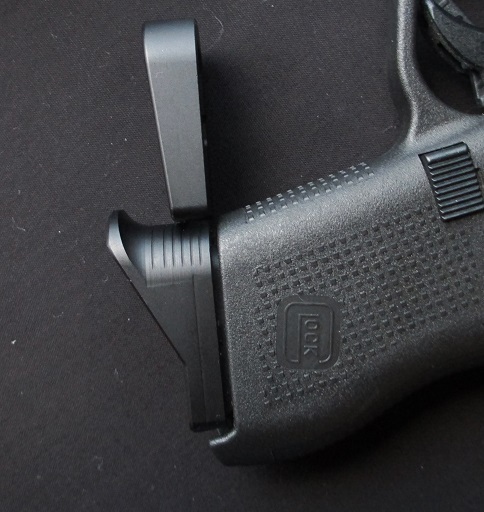 The G42 also features the standard “place holder” Glock sights. I found out a few weeks ago that Trijicon is now making night sights for the G42, so I’m adding those to my short list of “must haves” for this gun. The gun is terribly light (13.76 ounces empty) and from what I have watched and read, it likes the 90 grain XTP bullet (which I can neither confirm nor deny because as you can see in the pictures I went with 90 grain Hydra-Shoks). I really like the “beaver-tail” like grip, which has (so far) kept my paws from getting bitten. My pinky finger doesn’t even come close to being able to get on the grip as it came from the factory, but I knew that going into this. I can’t get my whole hand on a G26 either and this is roughly ¾ the width of the sub-compact Glock series of pistols. Having said that, I was very pleased to discover the new extended basepads for the G42 that Bastion, LLC is currently machining from T6 billet. I like the more extended version the best, but they both featured immaculate machining and uniform hardcoat anodizing. Compared to other options (the Vickers ones make the G42 look like a Shield, and the Pearce are fine, but aren’t anything special) the finger extension version is fantastic, and offers a full grip at the expense of presenting a bit slower out of the pocket. Drawing from a holster, that one negative would be a complete non-issue (it would actually be a benefit). The extended basepad without the finger extension doesn’t add much in the way of purchase (my dominant pinky still does not fit all the way on the grip), but I still like the added weight and “solidness” of the aluminum over the stock plastic, and it drops free like a brick. Both are extremely well-machined, and even after multiple drops from standing height during reload practice, the hard coat anodizing on both was unphased and showed no scratches, dents, or marks. I spent about half the summer pocket carrying this micro pistol. 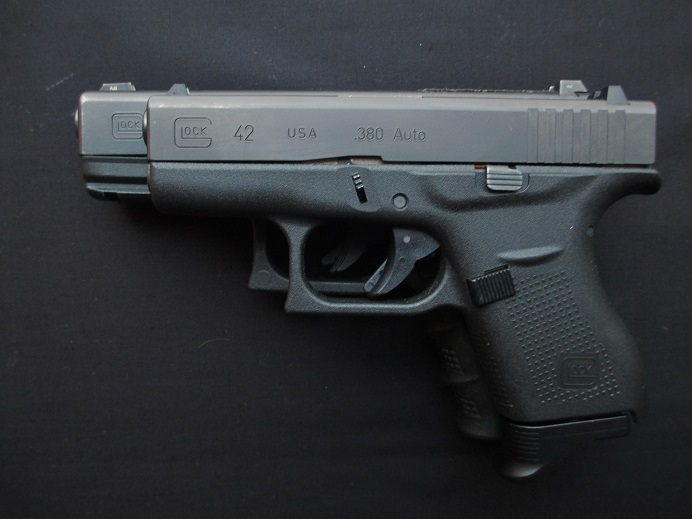 The G42 disappears in a pair of cargo shorts or blue jean pockets. In fact, it’s barely bigger than a Kimber Pepper Blaster, if you need a reference point. HP Industry Partner Blade-Tech is already manufacturing and distributing the Revolution Klipt Appendix Holster for $29.99 for those of you who are not comfortable with pocket carry. And holster options will never be an issue with anything made by Glock, for those of you who are also uncomfortable with appendix carry or prefer a standard IWB. They aren’t exactly even, but this view shows the length of the G42 extension by Bastion as compared to the author’s magazine-less G23. Nick Sporinsky is a contributing writer for Handgun Planet and an avid supporter of the Second Amendment. He is a career Army Officer and has been participating in IDPA competitions between deployments to the Middle East since 2008. He currently holds a Sharpshooter classification in both Stock Service Pistol as well as Enhanced Service Pistol. He resides in South Carolina with his wife and 3 children. Great review Nick. We just got one to for the wife and she loves it. She and our two daughter in law/fiancé; both new to shooting just love it and shoot it very well. Slick little blaster. Nice review, Nick. Maybe someday you’ll let me shoot your new toy. Hey, I’ve even got the ammo! I am an unwavering fan of Glock’s quality and dependability. In a crunch it’s the one handgun I want to be carrying. However, they are predictably ten years behind the curve. While they were fooling around with solutions looking for a problem (45 GAP and the Gen 4 series), other firearms manufacturers were busy designing ultra-compact pistols chambered in both .380 ACP and 9mm Luger…and selling them at a price point the budget-minded can afford. Glock could have almost dominated the ultra-compact market had they introduced a single-stack 9mm pistol. I am pretty sure the technology exists for them to do so yet they keep dragging their feet. I wanted to add something about how to remove the G42’s trigger pin. After removing the slide all you have to do is press down on the slide lever just behind the locking block. Use your right index finger, or you can use the end of an unsharpened pencil. 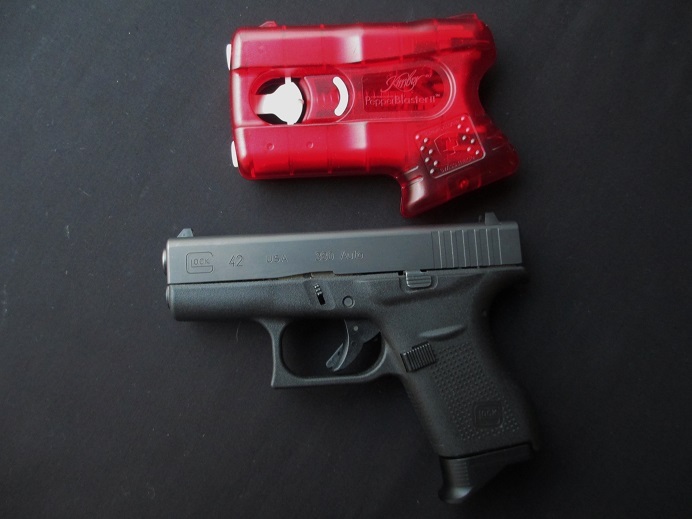 Push down on the lever while pushing on the left side of the trigger pin with a Glock tool or a 3/32″ punch. It’ll pop right out. 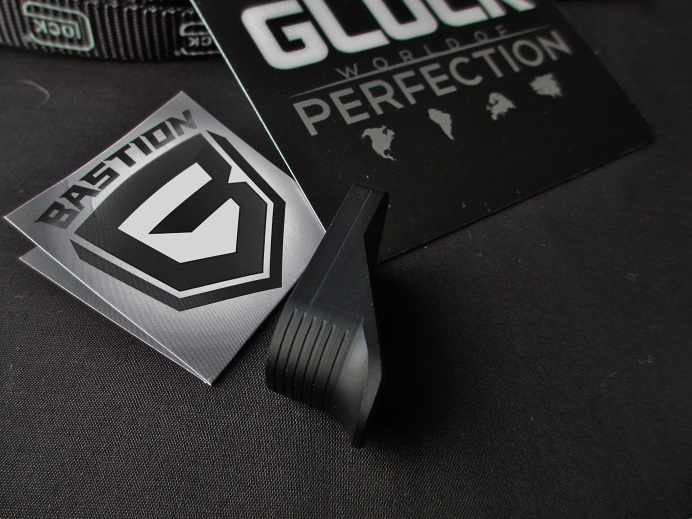 The spring tension on this lever pushes the lever UP versus down and rearward on other Glock models. YouTube videos have shown “gunsmiths” hammering away on the pin with a punch and hammer. Not necessary! John, thanks for the insight! Hopefully our readers will save themselves some trouble here. YouTube and “gunsmith” being in the same sentence always makes me pause for a second. Thanks for offering a simpler solution.